After selling millions and being a cultural phenomenon in Japan, the Nintendo 3DS family of systems role-playing game YO-KAI WATCH is coming to North America. Published by Nintendo, YO-KAI WATCH centres on a boy who gets a special watch that lets him befriend and help mischievous Yo-kai* and later summon them to fight other Yo-kai. Players can overcome challenges and help various characters solve everyday problems with the help of Yo-kai friends. These eccentric Yo-kai resemble anything from inanimate objects to mythical creatures. After the 2013 launch in Japan, the Nintendo 3DS game became a top seller and was well-received by both critics and players. 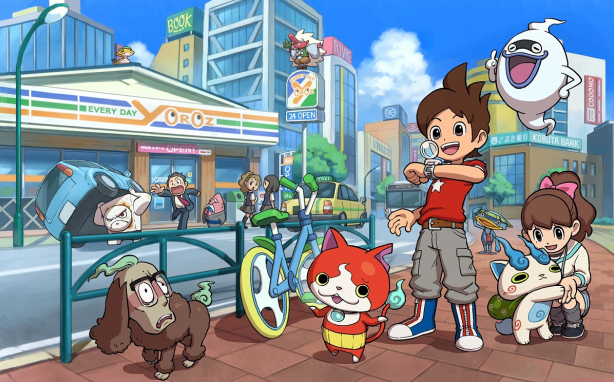 Along with the anime and manga, the YO-KAI WATCH phenomenon evoked wide-spread popularity and demand for the brand among children. YO-KAI WATCH is launching in North America, Latin America, Europe, Australia, New Zealand and Korea, demonstrating its global demand and appeal. Beyond video games, manga and anime television shows, YO-KAI WATCH has generated more than $1 billion in retail sales of toys and other merchandise in Japan, not counting games, music or publishing. *Yo-kai: They are not ghosts, monsters or creatures. Yo-kai are, quite simply, Yo-kai. They cannot be seen by the human eye, but they are everywhere. Whether born from the soul of a deceased human, or an everyday object discovering its higher purpose, their personalities are distinctly humanlike. This entry was posted on Thursday, April 9th, 2015 at 11:45 am and is filed under Everyone, Mobile, National News, Puzzle, Upcoming Releases. You can follow any responses to this entry through the RSS 2.0 feed. You can leave a response, or trackback from your own site.